There are a few things every experienced baker thinks of trying in their lifetime. They are recipes that are known to be notoriously finicky and difficult, usually French. The kind of desserts you buy at the bakery because it’s not worth the trouble making in your own kitchen. One of these recipes is the croquembouche. 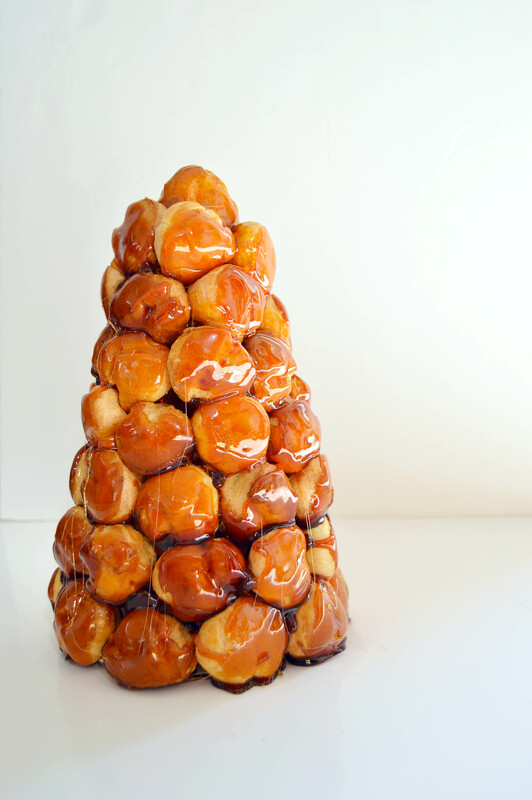 In fact, if you google “difficult desserts to make”, the croquembouche makes the list almost every time. 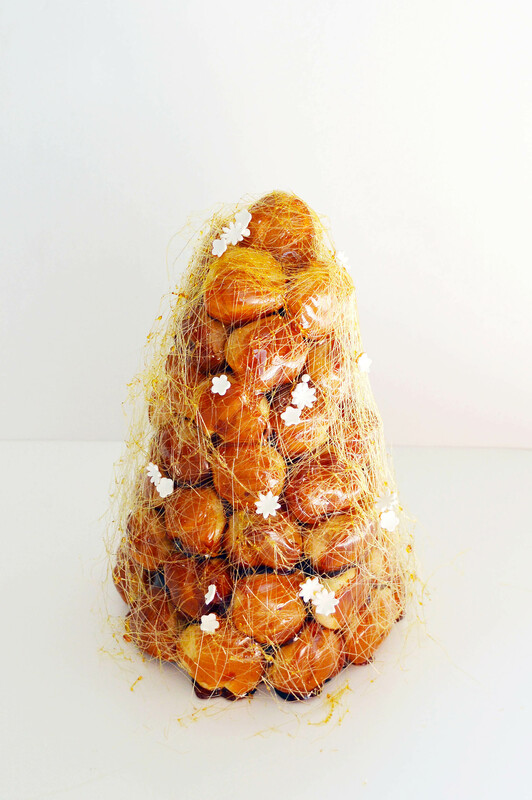 So what is a croquembouche? I would describe it as a tower of caramelized cream puffs, held together only by caramel and covered by delicate sugar threads. It’s definitely looks impressive and I can see why some people would choose one over a traditional wedding cake. Plus, that crunch of the caramel over the cream puff is really delicious. Almost like a crème brûlée wrapped up in a cream puff. 1) I think the most difficult/scary part of making this is the hot caramel. I am not embarrassed to admit that I burned my fingers a few times while making this. Have a bowl of ice water on hand just in case you do burn yourself. Your gut reaction may be to put the finger in your mouth to cool it (at least mine was), but that will not help the burn. Take your time when dipping the creampuff into the caramel, and if the cream puff gets stuck in the sugar, then use a spoon to fish it out. DO NOT attempt to take it out using your fingers. This is not something that can be done in a hurry, so make sure you have plenty of time before doing this step. 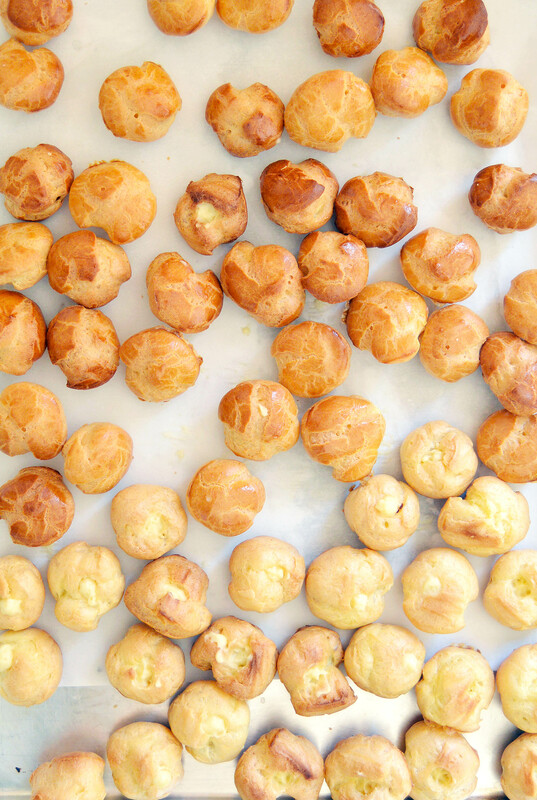 2) No matter how carefully and evenly you try to pipe the pâte à choux (the cream puff batter), you will end up with unique looking cream puffs. 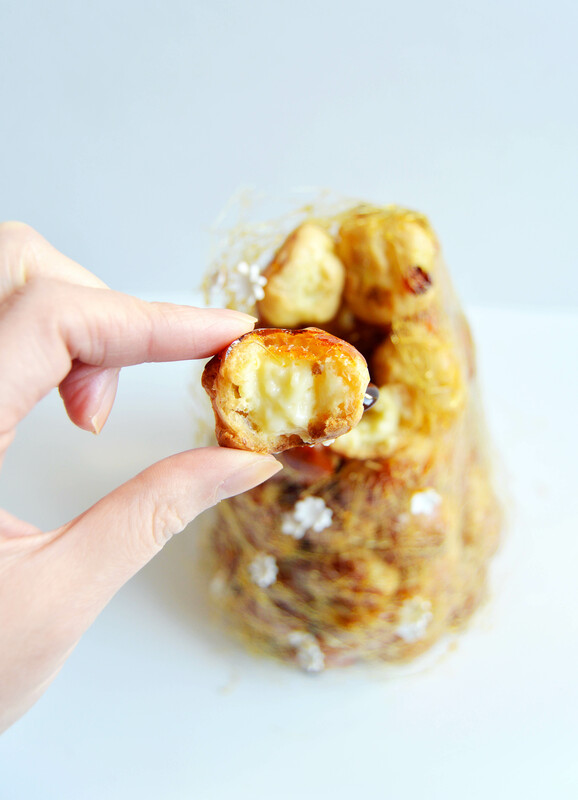 At first, you may be disappointed, but the funny shapes come in handy later on when you’re assembling the croquembouche. It becomes kind of like a game of Tetris, where you try to find that perfect piece to fit that nook. 3) The most fun part is making the sugar threads. When the caramel is somewhat cool, you take your fork and spin it around the croquembouche making a fine web of sugar strings. It makes you feel like a spider and you can do as much or as little as you like. 4) I tried to put fondant flowers on it and realized it was not worth it. The fine sugar threads harden as soon as they touch the cream puffs and there is no way for the fondant to stick to it. I just wedged it in between the gaps that were created. I wouldn’t recommend trying it. It wasn’t worth the work. 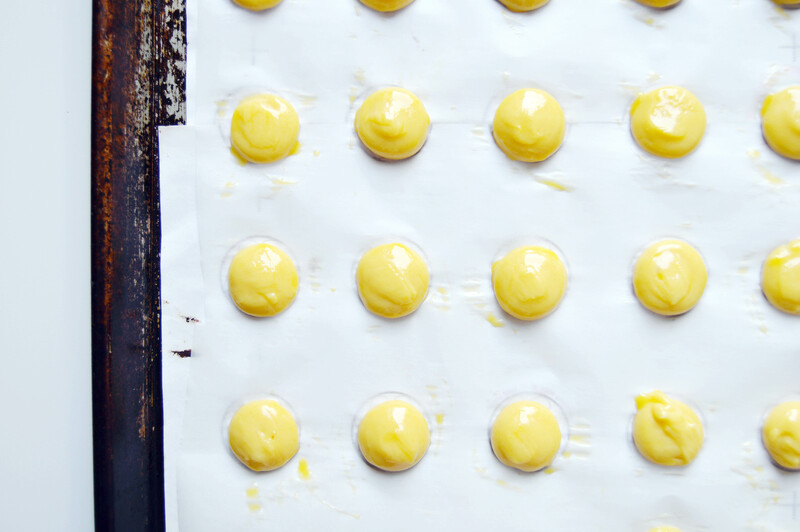 Line baking sheets with parchment paper and preheat the oven to 425˚F. In a large saucepan, bring the water, butter, salt, and sugar to a boil. Once the mixture reaches a boil, remove pan from heat and dump in flour at once and quickly stir with a wooden spoon. Once all the flour is incorporated, return the pan to the heat and cook the mixture for 30-60 seconds by continuing to stir the mixture with a wooden spoon until a thin film forms on the bottom of the pan. Move the dough into a mixing bowl of a standing mixer fitted with a paddle attachment and mix for about 1-3 minutes until the dough is cool enough for you to stick your finger in. After that point, add 4 eggs, one at a time until incorporated. If the dough does not fall off the paddle in a “V” shape, add the fifth egg. In a pastry bag fitted with a large plain piping tip, pipe 1 inch circles of dough. In a separate bowl, make an egg wash by mixing 1 egg and 1 ½ tsp. water with a fork until well mixed. Use a pastry brush and lightly brush dough with your egg wash, brushing down any peaks you may have formed when you piped out the dough. 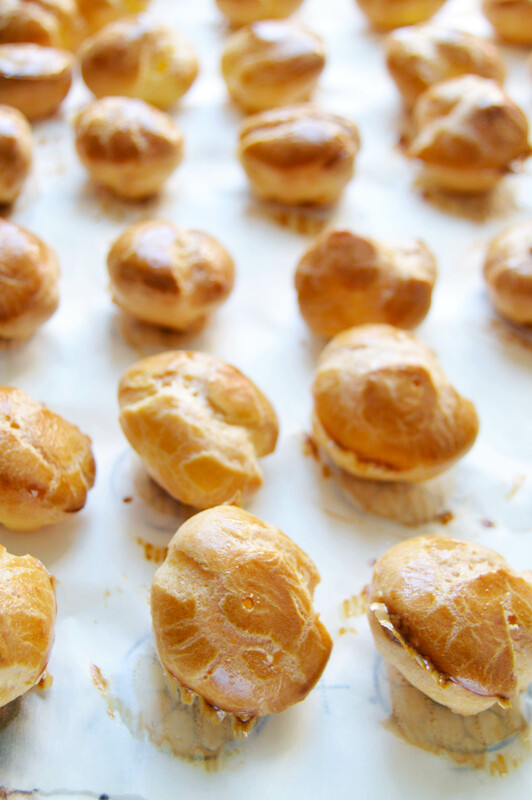 Bake your cream puffs one baking sheet at a time in the center rack of your oven. Bake for 7 minutes and reduce the heat to 375˚F and bake for 10 minutes until golden brown. As soon as they come out of the oven, poke holes in each puff with a toothpick to release trapped steam. In a large saucepan, bring milk and ½ c. sugar to a boil. While the milk is heating, whisk egg yolks, eggs, ½ c. sugar, cornstarch and salt in a medium mixing bowl. When the milk boils, slowly add milk to the egg mixture while whisking, one ladleful at a time. Once half of the milk mixture is added, add the egg mixture back into the milk mixture. Continuously whisk the mixture over medium heat until the cream thickens. Once thickened, take the mixture off the heat and mix in the butter until completely incorporated. Stir in the vanilla extract and orange blossom water. Strain the mixture through a sieve and place a piece of plastic wrap directly on top of the pastry cream to prevent a skin from forming. Refrigerate until ready for use. Prepare a metal bowl with ice water. In a saucepan, boil sugar, corn syrup and water until light amber. Do not stir while the sugar is cooking, it can cause crystals. Once the caramel becomes light amber, place pan into the ice water to prevent further cooking and cool the caramel. Place a 5 ½ inch cake board on a sheet of parchment paper. Fill the cream puffs with the pastry cream. 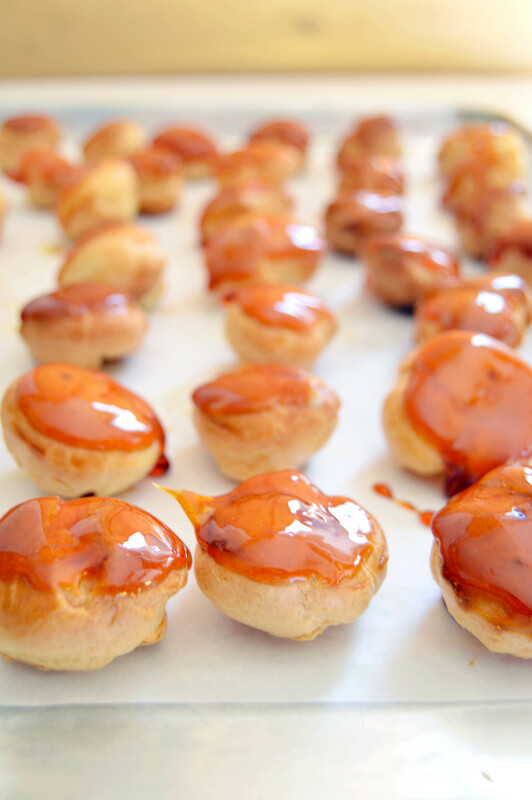 Use the larger cream puffs for the bottom of the croqeumbouche. Dip the bottom of the first creampuff and stick to the outside of the cake board. Dip the next cream puff on the bottom and to the side, to stick to cream puff that is already on the cake board. Repeat the process until the first layer is done. When doing the second layer of cream puffs, arrange the cream puff in between each cream puff on the first layer, to create a stable tower. Continue to dip and build, heating the caramel if it becomes too hard. Once the tower is built, cool the caramel until it forms a thread when you lift it from the pot with a fork. 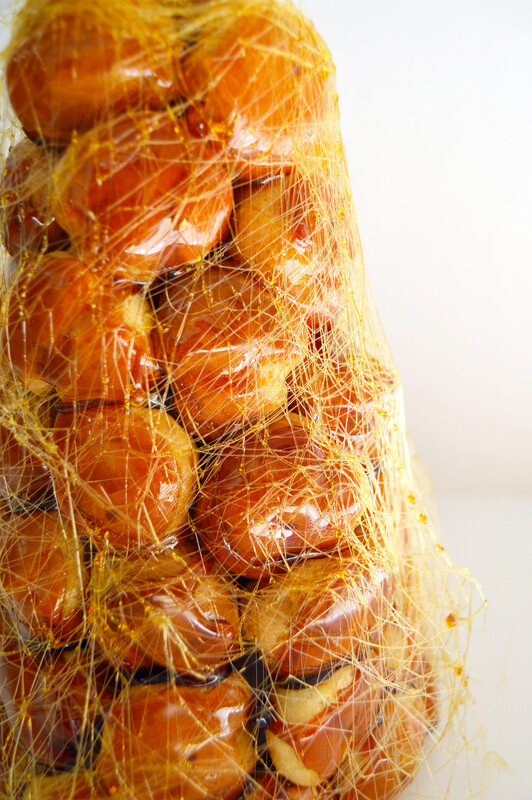 Dip the fork into the caramel and circle around the croqeumbouche to create a web of caramel strings around it. Pâte à choux recipe adapted from food network. Pastry cream recipe adapted from all recipes. Caramel recipe adapted from bon appetit. This entry was posted in Bread, Cakes, Caramel, Cookies, Desserts, Floral, Vanilla and tagged Cake, Caramel, cream puffs, croqembouche, Floral, orange blossom, vanilla. Bookmark the permalink.